In 1984 at Gen Con, I first served as an official dungeon master for a table full of strangers. I ran the adventure that would become I11 Needle. As I explained in “Running I11 Needle at Gen Con in 1984,” the session fell short of my standards. Frank Mentzer, please forgive me. In the years since, I’ve run many more convention games. I’ve improved. Sometimes I even meet my standards. 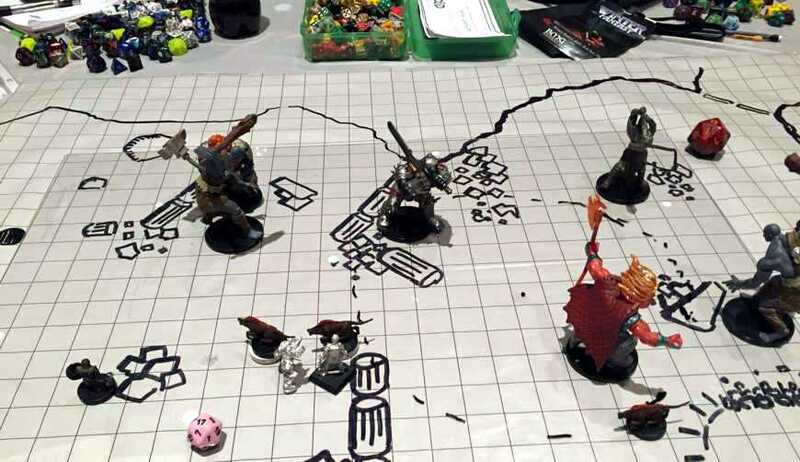 This year at Gen Con, I ran 8 D&D Adventurers League sessions. This post explains how I prepare these sessions. I start by reading the adventure twice. My first, quick read provides a high-level view. When I finish, I want to know the important characters, the expected course of events, and the clues that lead the player characters through these events. Most adventures feature an overview intended to serve the purpose of my first read, but these summaries never seem to help me. When I take my first look at an adventure, I’m keenly interested in what leads the PCs through the narrative. But a typical summary just lists events: “After finding the casket of wrath, the characters go to confront Lady Frost.” I need to know what motivates the characters to go from one event to the next. Those leads become the most important clues I must communicate to the players. The first read enables me to reread knowing which details merit careful attention. I can sift clues from set dressing, key characters from extras. During the second read, I pay careful attention to the decisions the characters will face. When I run the adventure, I can miss a bit of color, but I must communicate the details that weigh on decisions. I tend to think a lot about the actions players might take during a session. Although I enjoy when players surprise me, I still imagine their likely choices and consider how to handle each one. Whenever I spot such an oversight, I plan on how to account for it. Will I reinforce the need to infiltrate the caravan? Will I present the cultists as too tough to confront? Will I let the players slay the cultists and then contrive a way to get the PCs to the next chapter. Sometimes I let players discover the risks of each option so players reach a dilemma. See “How to improve your game by forcing characters into tough choices.” Sometimes, I just make players understand the facts that make a bad strategy bad. On my second read, I may mark up the pages. I cannot bear to mark up a hardcover adventure, but Adventurers League pages call for the red and blue pens. In blue, I break the wall of text with sub-headings that flag key information. In play, I rarely scan my headings, but when I do, they can cut minutes of text skimming. Plus, the process of writing headings turns me into an active reader. I notice things that I might otherwise overlook. I remember more at the table, so I look down less. In red, I write names and other bits of text I must find at a glance. Names always go in red, as do quotes that I might read as I glance down. On any dungeon maps, I note everything I need to know. My captions include monsters, locks, objects of interest, difficulty classes and so on. Ideally, I can run all the rooms from the map. 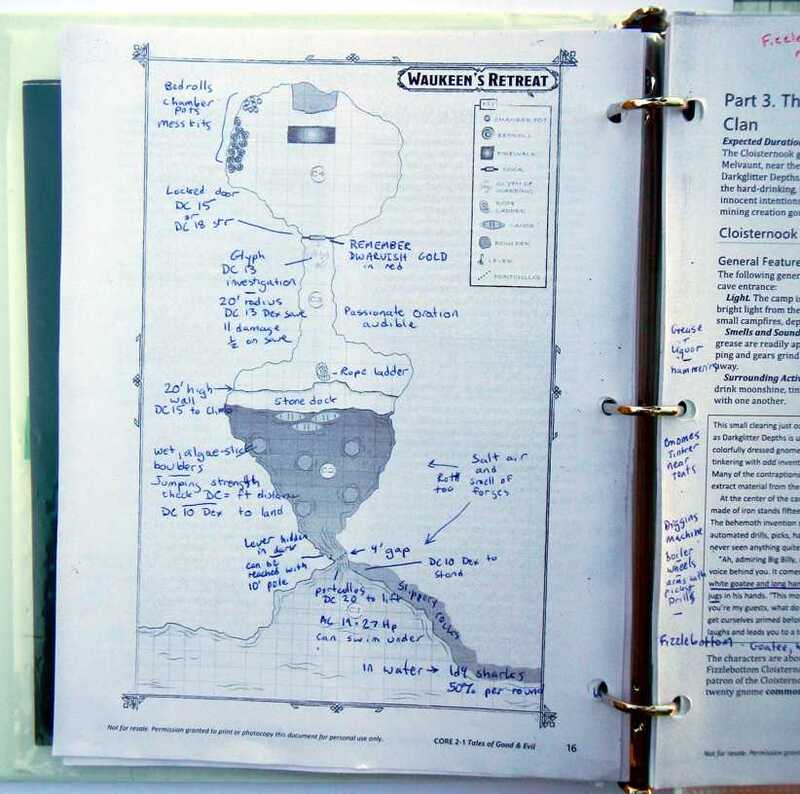 When I first started running organized-play adventures, I would work from a packet of pages. This led to disaster. As I referenced maps, monsters, and descriptions of encounter areas, I plucked them from the pile. Half way through the session, I faced a shuffled heap. While I spent minutes hunting for that one sheet, I stammered apologies. Now, all my adventures go into a loose-leaf binder with tabs separating each module. 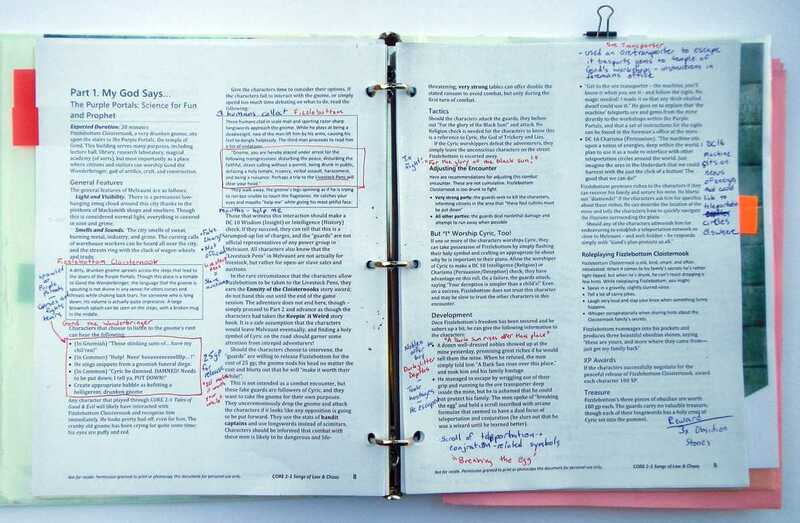 Double-sided printing makes the best use of space. I print second copies of the maps and monsters on single-sided sheets of colored paper. I can pull my green, monster stats at a glance and I never lose them in a stack. 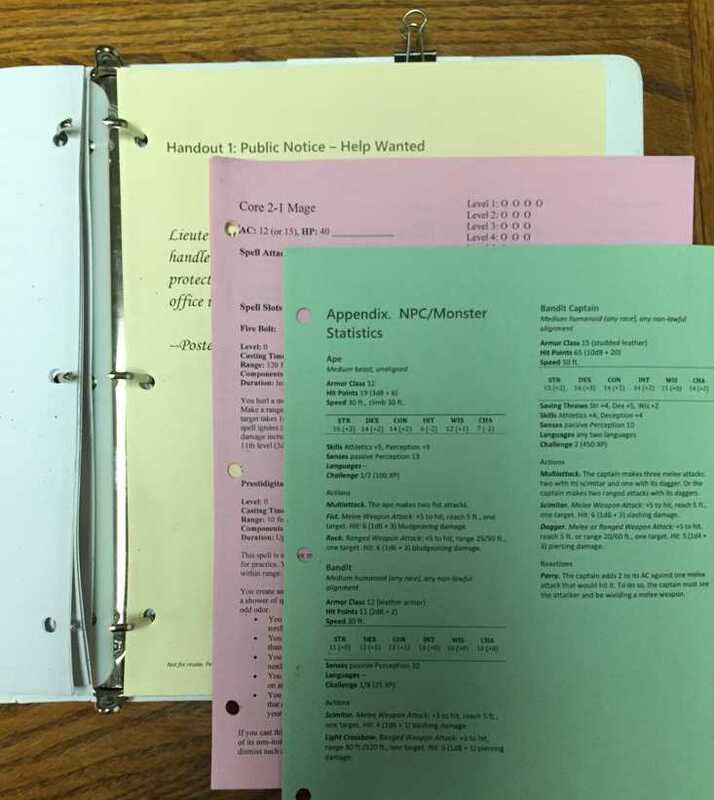 Player handouts, including magic-item descriptions and story awards, also go on colored paper and in the binder. If I plan to run an run an adventure more than once, I use card stock. 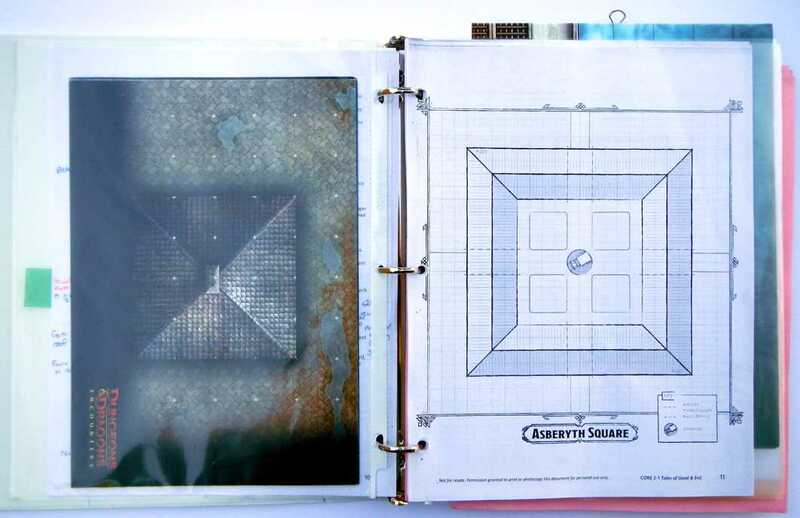 For any of the adventure’s encounter areas, I look for pre-printed maps in my collection that suit the location. Many encounters rely on few specific details, so any map that captures a location’s flavor will serve. When none of my existing maps fit, I might print or sketch a map in advance. If an adventure always lands PCs in a location, I’ll wind up drawing the map anyway. Drawing in advance saves time at the table. Plus, if I’m running an adventure more than once, more players can enjoy any effort I invest in maps. After years chasing miniatures, I can match most monsters with suitable figures. If I lack figures, I may use the excuse to add to my collection, or even fabricate a figure. No one leaves a D&D table annoyed because they needed to use imagination. 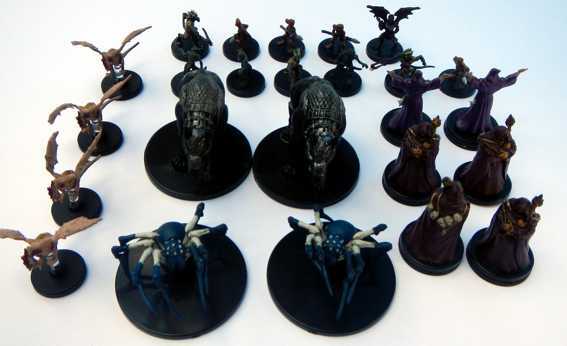 So if you lack miniatures, you can bring tokens or even candy to represent monsters. How do you prepare for a published adventure? This entry was posted in Adventurers League, Advice and tagged Adventurers League, battle maps, Frank Mentzer, miniatures, organized play, preparation. Bookmark the permalink. Hey David! As always a great post! Thanks for your efforts and sharing your expertise. You mentioned years of collecting miniatures such they you have appropriate figures for most situations. I am rapidly building my collection, so I was wondering how you organized/store your minis? Thanks! Thanks! 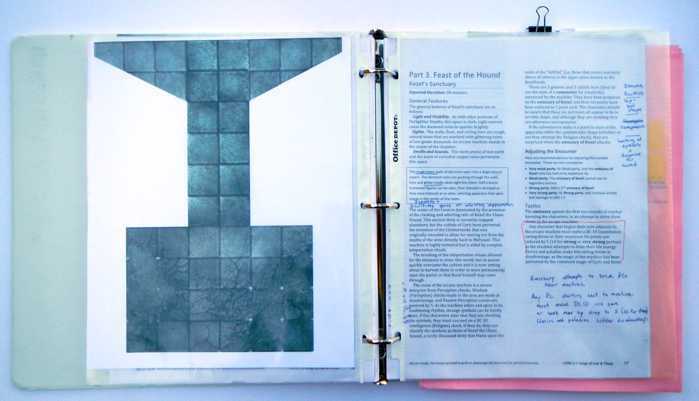 I wrote about organizing miniatures in Secrets to storing and retrieving D&D miniatures. Good write up, stealing some of those ideas for sure. Enjoyed this read, David. Back when I had the timed had no children, this is the kind of prep I’d put into my modules as well. Now I’m a teacher, and running lessons and activities in class smoothly is essentially the same set of organization and presentation skills. I always had fun doing it. I probably have a dozen modules that I wrote and/or marked up with annotations that we never even played! Thanks for commenting. Glad you can put skills honed by D&D to good use in the classroom. I’m not someone who enjoys prep enough to stockpile modules. – Make monster initiative tents with the statblocks on them – I very rarely reference the statblock in the module while running the game. – Make an “HP tracker” – simply a list of all the monsters in the mod, sorted by encounter (and with an XP total for each encounter to make math easy later), and their total HP. I find it easier to track hp and conditions during combat here than on the same notepad on which I track initiative. – Print any handouts/visual aids I might need. If I’m short on time, I’ll just use cardstock – parchment-colored if I want to be fancy. Time permitting, I might get artsy about it. – Draw/print maps. I usually go the hand-drawn route, but if an area is really complex/detailed I might just blow up and print the included map. – Compile minis. I sort the minis I’ll need into a Plano box with dividers – a separate box for each mod if I’m running more than one. – The night before/day of: skim through the mod a final time, making sure I understand the expected course of events and any possible deviations. Practice voices/characterizations of NPCs. All told, this process probably ends up taking 4-8 hours, spread out over a few evenings, depending on the mod. Which probably seems like a lot, but it’s really about getting my confidence level up and making sure I’m familiar enough with the material to run most of it from memory. It’s more about “feeling” ready than actually “being” ready, if that makes sense. I’m to this article rather late, but what a great read! And pics to boot! This is the kind of “how to prep” gold that is just so difficult to find on the internet. Very helpful. I’m curious: when you mention reading an adventure twice, does that also apply to WotC’s recent mega-module books? Or do you do a once-over and then read through only the section you’re about to run for a second time? Curious to know your method. Thanks for the kind words. You guessed my method of preparing for the mega-modules. I try to read once cover to cover. Then, before a game session, I read the section likely to figure into play. At the end of a session, I’ll ask the players what they plan to do next. How do you prepare for an adventure from a hardcover book? Do you also Make notes?